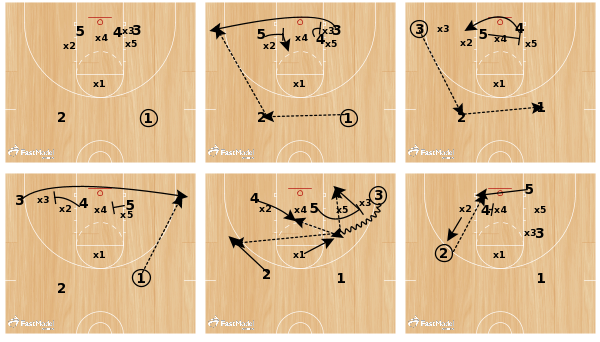 Part 3 of my series on attacking junk defenses looks at simple and effective ways to attack a box/diamond and 1 defense. In my previous post, we discussed developing your offensive philosophy regarding how to attack junk defenses. Will you run play(s) to free up star player, or will you run play(s) to give your other players easy scoring opportunities. 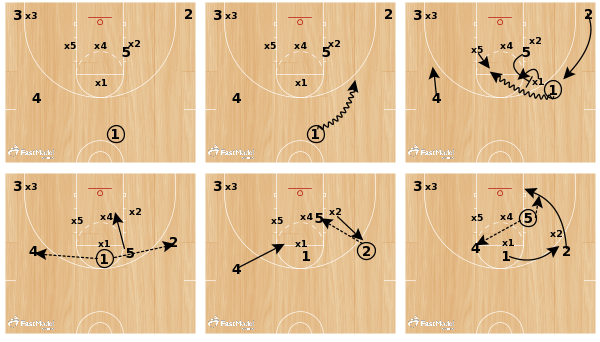 The first offensive set “3-low” is versatile in that it allows you to place three offensive players along the baseline, thus outnumbering the defense. In the diagram below, we start by forming a triple stack on either block with our player being guarded M2M on top. 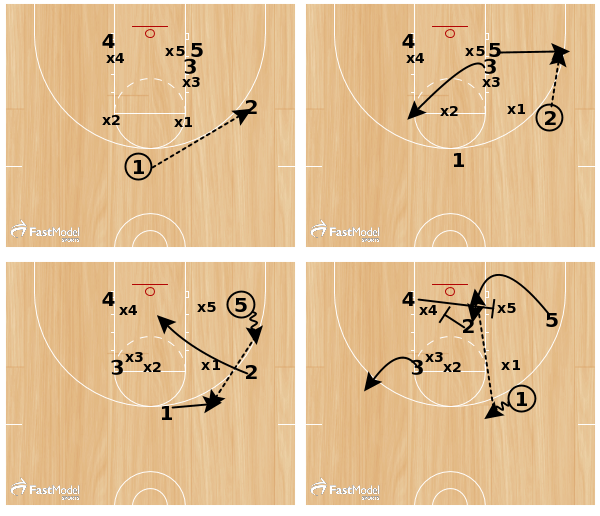 To initiate the action, the point guard uses a freeze dribble to attack the top defender in the box and the players forming the stack set a double screen on the low box defender and the middle guard looks to pop out to shooting range. If the bottom of the zone shifts out quickly to defended the short corner/corner shot, the ball side post immediately screens away and brings weak side post across the hoop for a baseline bounce pass. If nothing develops on this action a quick pass to the point guard followed by a ball screen by the guarded player and the action can be run to the other side. If at anytime the bottom box defender anticipates the corner pass, the point guard can ball fake and immediately hit the post player slipping the screen on the block. You can also run this play with your player being guarded M2M as the baseline runner. Here is a diagram of “3-low” being run against a 1-3 chaser or Diamond and 1. In this version of “3-low”, we are using our two post players along the baseline as screeners and sealers and our top two guards as gappers. The two top guards are to play in gaps and be ready to penetrate and pitch against the one guard front. They are also trying to read the defense as our guarded player comes off of baseline screening actions. This play has the same action upon a baseline catch in that the strong side post player immediately screens away for the weak side post player. If a star player catches in the corner, the ball side post can also set a ball screen for the guarded player. 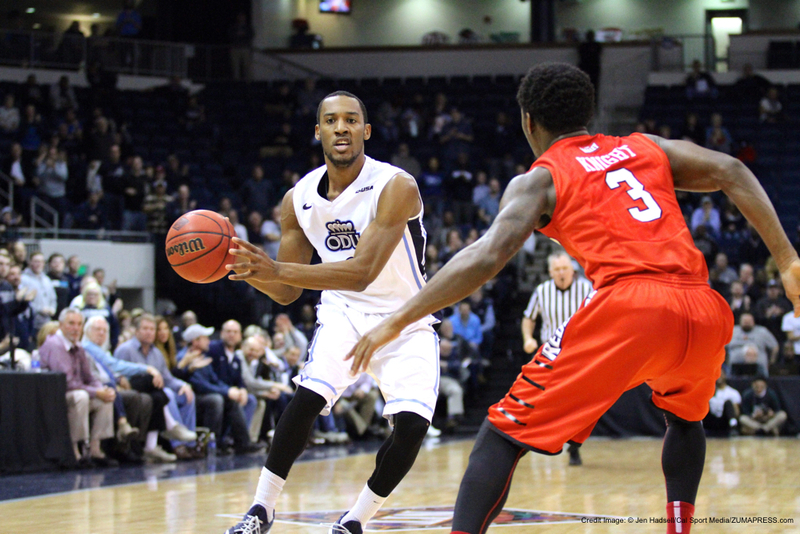 This puts the defense in a vulnerable position and forces help from the zone players. As you can see in the diagram, the player has multiple reads off the ball screen (shot, roll man, reverse). My favorite part of this action is that you are engaging multiple defenders thus creating action and indecision by the defense. 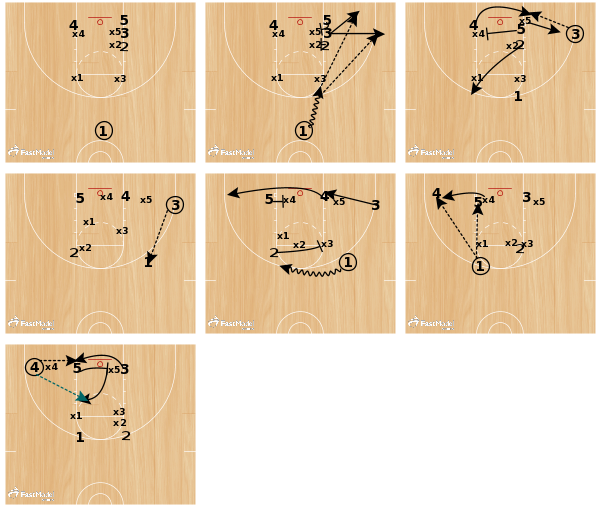 The next set called “Fist” uses a PNR continuity offense as a way to attack either a box and 1 or 1-3 chaser. Your point guard needs to initiate the action by dribbling opposite your guarded player setting up a side ball screen with your low posted player. Your other players unguarded players ( 4 and 2 ) fill the ball side corner and weak side slot area. Most zones go under ball screens, so as th point guard comes off ball screen she should immediately look to penetrate elbow are for a shot. If the defender goes under the ball screen we teach our post player to “bury” the defender by performing a reverse pivot and sealing off defender and allowing the point guard to attack elbow area for a shot, pitch ahead, or a pitch back. The next two plays are designed to get both an inside score and/or an outside score. The first play is called “gut” because it is designed to get the ball right into the gut of the zone defense. The play starts by the point guard passing a guard on the right-wing. The guarded player then goes to opposite elbow area while a pass to the corner is designed to bring the bottom player of the zone out away from the block. 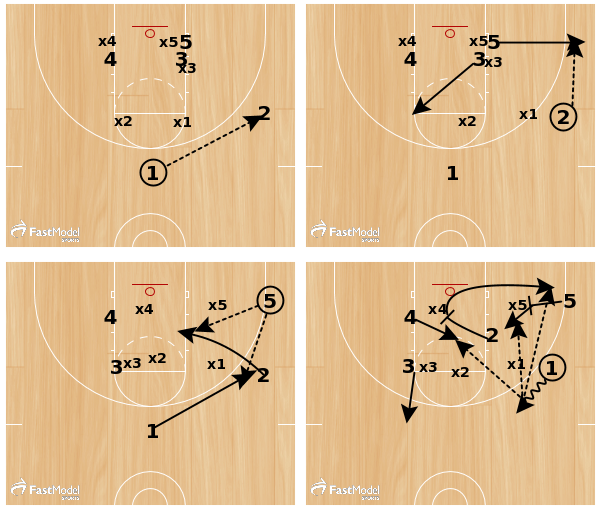 After passing to the corner the guard cuts hard looking for a quick give and go and one the point guards catch screens the weak side of the zone bringing the 4 man right into the gut of the zone for a quick pass. After setting a screen the guard will then receive a screen by the post player creating some misdirection and difficulty for the defense. The counter off of “gut” is “gut again” where we use the same action as before but we are now trying to screen the bottom two defenders in the box allowing our 5 man to catch again in the gut of the zone. I have had tremendous feedback so far in this series and I hope you can take some of these concepts back to your program and integrate into your offensive playbook.